Why is Drug Discovery So Hard (and Expensive)? Notwithstanding herbal medicines and the re-emergence of leeches as therapy, it is only in the last 70 years that physicians have had proven medical science to support “the healing arts.” Potions and procedures of dubious value have been replaced by powerful medicines that treat infections, heart disease, diabetes and mental illness. While the benefits are clear, the difficulties and cost of creating new medicines are a source of widespread frustration to patients and industry alike. FDA Matters is impressed that current efforts to speed up drug discovery are gaining momentum. At the same time, the nature of human biology dictates that the creation of new therapies will never be easy or inexpensive. Recently, Matthew Herper of Forbes wrote about the “truly staggering cost of inventing new drugs”, a range he put at $4-11 billion per success! The point is that every success is bearing the cost of a staggeringly-large number of expensive failures. the ability to discern and discard promising-looking compound that are, nonetheless, likely to fail at later stages. The growing consensus behind these goals has pushed collaboration and innovation much faster than would otherwise be expected. Identification and validation of biomarkers, pharmacogenomics, toxicology databases, and new compound screening methodologies are among the many approaches to enhance the discovery process. FDA has acknowledged the need to be more attuned to advancing medical innovation as an integral part of the agency’s role in promoting the public health. This was reflected in FDA’s October, 2011 report, Driving Biomedical Innovation: Initiatives to Improve Products for Patients and by its willingness (during user fee negotiations and other venues) to commit to more early-stage meetings with companies. In addition, FDA has committed resources to creating and validating new tools and methodologies for drug discovery. Most important of all, FDA recognizes the need to act on the critical next stages after drug discovery by creating a more predictable regulatory pathway that minimizes the time that it takes safe and effective new medicines to gain approval. All these activities taken together may produce dramatic improvements on the front end of drug discovery. This would provide the ability to focus on the “most promising, least likely to fail” compounds and reduce the number of expensive failures. In some cases, companies and regulators might know enough from the initial discovery screening to shorten or narrow pre-clinical and clinical testing. The new focus and activity on drug discovery is reason to be hopeful….but these efforts will take time to bear fruit. 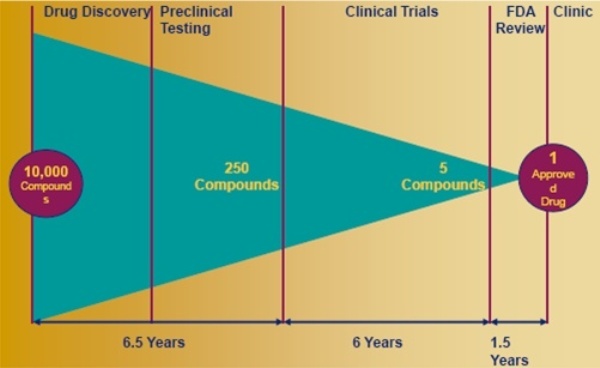 The process of taking a compound “from bench to bedside” must still be measured in years. Optimism should also be tempered by realizing that the human body is almost always more subtle than we can discern, even with the best predictive tools. New uncertainties emerge, even as new biological information resolves old uncertainties about diseases and drug development. No matter how much we know, there will always be clinical trials that fail, sometimes quite miserably, just when everyone is most sure that the solution is logical and success guaranteed. That’s why drug discovery will never be easy or inexpensive. The last two links connect readers with earlier columns on biological complexity: Is the Human Body Just An Exquisitely Intricate Machine? and Scientific Reductionism and the End of Medicine. For those interested, there is a third column on this topic: Personalized Medicine in Perspective. This entry was posted on Monday, March 5th, 2012 at 8:58 am	and is filed under Drug Approval and Access, FDA and Industry, Insight on FDA-regulated Industries. You can follow any responses to this entry through the RSS 2.0 feed. You can leave a response, or trackback from your own site. The situation for medical devices is somewhat similar, although the numbers look a bit less Olympian in terms of expense. On the other hand, drug makers tend to be much more vigorously capitalized and unless I’m mistaken, start-up device makers are a bit more at peril when an effort fails. I think part of this is that all the easy cures and diagnostics are already out there, and the addition of NIH and FDA to the mix just reinforces the notion that it is enormously difficulty to nudge things along. Computational science will help, but how much? That base of data will take time to fill out just for a “typical” human, and the variation in human anatomy and physiology will add layers and layers of complexity. Hate to admit it, but I tend to agree that new therapies and diagnostic tools simply will never be cheap. Medical science is stuck with the task of doing more and more difficult things. If it’s any consolation, other areas of the economy such as energy research probably face a similar dilemma: The easy stuff has been done and the costs of materials, processing, knowledge and so on just make it next to impossible to come up with a Eureka moment in someone’s garage. The only garage-based eureka moments nowadays are experienced by those noisy teens who forget to turn down the amplifiers after 10 o’clock at night. Other than that, forget it. Mark—-Thank you. Very helpful to know that the view in medical devices is similar. You’ve raised an additional interesting question in your comment: was the past easier and less expensive and, if so, why? Your suggeston–that the low-hanging fruit have been taken–is a very common one held by a great many very smart people. I’m not sure I agree and I may take this up in a future column. We tend to view past accomplishments as easy….forgetting the costs and struggles and uncertainty that proceeded them. To take an otherwise non-germane example–in retrospect, it was inevitable that the Allies would win World War 2 (because that’s what happened). But there was nothing inevitable about it if you were living in 1942 and didn’t have the benefit of being able to see the future. So, too, a lot of the scientific and medical fruit we enjoy today, weren’t necessarily low-hanging when they were discovered or invented. We have made them so in our mind. Tomorrow’s challenges are not innately more difficult than was the achievement of yesterday’s challenges. What I tried to convey briefly at the end of the column is that biological complexity will always be a prime reason why drug discovery isn’t easy or inexpensive. And that is true no matter where you stand in the continuum of biological knowledge. In a couple of my blog columns linked at the end of the article, I go into why more knowledge doesn’t eventually make it easier (man as biological machine is a metaphor, not a fact; limits of reductionist thinking in biology). All that said, it is still better to have more biological knowledge than less….it just doesn’t predetermine whether the next task is easier or harder (and in most cases, I think, it is both). Definitely a topic for another column. Good point about what seems easy today being complicated at the time. I guess I should have said it was easy relative to what they’re trying to do today. Another thing occurred to me in this context is what I believe to be the speculative nature of the huge sums being spent on drug, biotech and device R&D. We all know that NIH now receives in excess of $30 billion a year and that the extra $10 billion it received via ARRA is already gone. But those sums are dwarfed by the monies invested by the private sector. For their parts, private investors are motivated by ROI and it’s difficult to argue that many see life science investment as potentially better than investments in other areas of the economy. Is it not possible that life sciences are over-invested and hence the marginal rate of return is failing badly? I remember thinking in 2006 that med-tech was perhaps a bit over-invested in cardiology. As an example, there were a number of small companies trying to wedge themselves into the space for ventricular assist devices. At the time there were at least three companies (can’t recall their names now) with a VAD pump based on a magnetically suspended, vertical-axis rotary pump design and at least another three using the encased Archimedean screw to push the blood. It was pretty clear to me at the time that roughly half of these projects would never get to market if only because they got there too late to compete effectively. Let’s look at cancer research. NIH plows untold sums into this disease all by itself, but when you look at all the investigations into nanoscale materials used as delivery vehicles (quantum dots, nanotubes and so on), it’s pretty clear that the washout rate will be pretty high. This doesn’t even begin to address all the research into molecular diagnostics, anti-proliferative drugs, and the various technologies to address the underpinnings of cancer in DNA, RNA, mitochondrial behavior and so on. As they told us in Econ 101, the more you invest in something, the more your marginal ROI suffers. In this area, that understanding translates into failed investigations into drugs and devices, whatever the reason for the failure. In some instances, it’s surely a case of going out on a limb for something that has longish odds at best, while in others it’s an understandably unanticipated problem with safety. In all cases, the argument can be made that a more modest investment in life sciences might yield a smaller number of spectacularly expensive failures and less utterly speculative investment. I’m unaware of any famous saying about busily chasing miracles, but if such a quote existed it might read something like this: Those who ceaselessly chase miracles might have overlooked a few wonderful but rather prosaic-seeming things along the way. Where investors are concerned, this means you’re bypassing opportunities with less blockbuster potential, but also with less risk. That obviously is an investor’s prerogative, but I don’t think it’s a stretch to say the investor is a bit seduced by the notion that this is the Golden Age of Medicine. Don’t get me wrong, I’m glad they’re interested, but conversely I don’t find it at all conspicuous that failures are so conspicuous and commonplace. If I’m right that life sciences are over-invested, routine and spectacular failures are the most natural thing in the world. Let me tackle this from, as you’ve described, the “bottom up.” The data show that our current, sorry state of drug development is a continuation of a progressive slide since the 1970’s. In a system that works this badly for this length of time, all parts of the process must be considered suspect. Having been trained as one of what many deem a genetic mutant – a physical chemist – I’m inclined to examine the validity of measurements. Having lived as an entrepreneur – also a likely defect of some sort – I look to the interplay of science/technology and capital. For drug development, the marriage of science/technology and capital is seriously dysfunctional. First the science. Harkening back to the ’70’s, we see the origins of “rational drug design.” Rather than the shotgun approach in use at the time, rational drug design asserts the ability to create a molecule that has the desired effects on the Target. We’ve learned to do precisely this and the number and diversity of molecules created has exploded. Of course, at the time only some 250 drug-able targets were known. Enter genetics (it wasn’t yet genomics) at a somewhat later date as the science/technology to discover new targets (Genentech was founded in 1976, Amgen in 1980). Thus, genetics provided the means to expand the target universe at just the time that we were learning to create molecules to modulate the activity of those targets. So far so good, assuming, of course, that the target identification is correct. We must note that these capabilities – target development and drug design – are very early in the drug development process. While we can screen molecules for target activity modulation at very high rates of speed, the selection process yields promising molecules – not drugs. Borrowing a term learned in chemistry or biology 101, we’ve completed “ligand” development – qualifying the molecule as a drug has yet to commence. What follows that initial screening? Very little with new information content. There are expensive means to examine the precise nature of the molecule-target interaction, but these merely confirm the nature of the interaction. They do not, cannot, anticipate the molecules fate in an intact organism. This is the chasm correctly identified by the NIH and bridging that chasm is the rationale behind the formation of NCATS. Will they succeed? Certainly not within a short time frame – proposals are only now being submitted. Consider also that today’s developers are the second generation that’s been trained on value of rational design and genetics-based target discovery as the linchpins of drug development. As we’ve seen they are the very early steps in the process and cannot be definitive. It’s also true that venture buys into this limited model as its rationale for investment. Why? Ever try building a bridge across a chasm with no tools, no lights and only a rudimentary idea of what a bridge looks like?